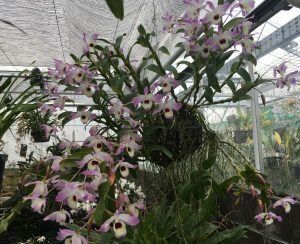 This article is the first in a series in which my students and I will share some of our observations about orchid culture at the Writhlington School Orchid Project and the joy we get from spending our time with these wonderful plants. For those who have not visited the glasshouses at Writhlington a little introduction may be helpful. We have a total of 240m2 of glasshouse and this is split into six sections. We provide different conditions in each of the six sections allowing us apply our observations of conditions in tropical forests around the globe to grow a over a thousand orchid species. 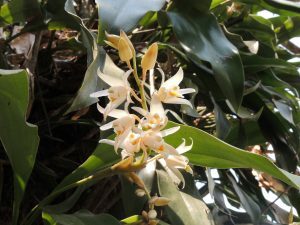 This series of articles will explore the conditions in these sections and the management of the orchids we keep in each. This article will take a look at our two coolest sections which we call Cool Asia and Temperate although the species we grow in each are fairly similar. A major aim of the Orchid Project is to use income generated to travel to tropical countries and to work with schools, colleges and conservation groups to help develop education and conservation in rural tropical communities. 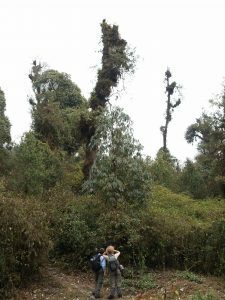 An area we have had the pleasure of visiting several times is the Himalayas and in particular Sikkim and Arunachal Pradesh where we have worked with schools and explored forests from hot tropical valleys up to the snows at 4000m and above. 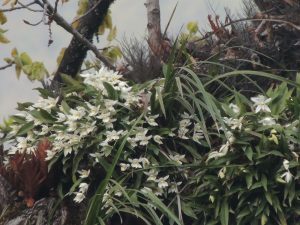 We have had the thrill of seeing a large number of cool growing orchid species in the forests 1500m or more above sea level and it is these species that we will focus on in this article. 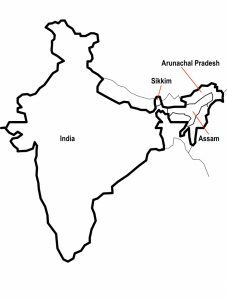 Sikkim and Arunachal Pradesh are in North East India and so are a fair distance north of the equator where the climate is strongly seasonal and dominated by the combined factors of the summer monsoon and the dramatic topography. Both Sikkim and Arunachal Pradesh experience wet summers and dryer winters although Arunachal has less summer rain as a result of warm wet air having passed over the mountains of Meghalaya first. From 1500m to around 2500m Sikkim has a band of diverse evergreen forest and here the wet season is really wet and the dry season is far from dry. During our visits to Sikkim in the dry season months October and March we have found that each morning the forests are dripping with dew and rain showers are not uncommon. We find that the temperatures at these times are around 10C at night and mid teens during the day. Coldest temperatures in January are a few degrees above freezing and frosts when they do occur have little penetration into forests. To replicate these conditions we have two cool sections one (Cool Asia) with a minimum of around 9-100C and vents that open at 14ºC and one section (Temperate) with a minimum of 60C and vents open from 100C. These sections allow us to match plants from higher elevations with cooler temperatures as well as stager flowering of some of our species just as happens in the wild where lower elevation populations of Coelogyne cristata flower before those at higher elevations. 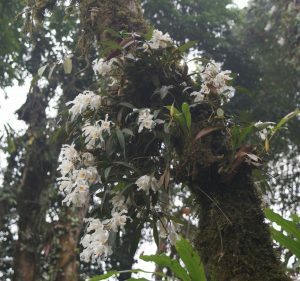 The majority of the species we grow that are native to these cool Himalayan forests at Cymbidiums, Coelogynes and Dendrobiums, so let us look at each in turn. Cymbidiums were my first love as an orchid growing teenager and I still get a real thrill from a well flowered species.We have seen a number of cool growing Cymbidium species growing in Sikkiim where they each have habitat preferences we can accommodate at Writhlington. 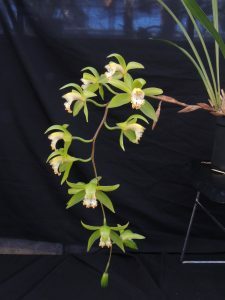 The first group of Cymbidiums is the large growing cool species such as Cym. hookerianum, Cym. tracyanum, Cym. mastersii and Cym. erythraem. These are all species of cool wet evergreen forests where they grow as epiphytes on the upper trunk and main branches of large trees and compete with ferns and other orchid species. Many cymbidium plants we have seen are clearly very long lived Cym. hookerianum in particular appears to have adopted a strategy of becoming established on a mature tree and waiting for the tree to die before flowering to its full potential and spreading many millions of seeds around the forest. The sight of dead trees with giant plants of Cymbidium hookerianum laden in flowers and seed pods from the previous year is a memorable one and reminds us that these plants enjoy good light and heavy feeding to flourish and flower well. 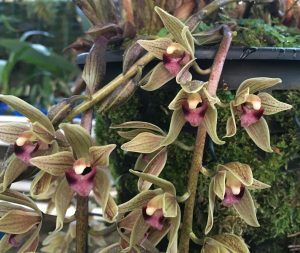 We have found that all these Cymbidium species really enjoy the cooler temperatures of our Temperate Section and we find a minimum of 60C and masses of fresh air result in optimum growth and flower production. Cymbidium devonianum occupies a different microhabitat and we found it growing in heavy shade low down on evergreen trees growing in detritus. This explains the broad soft leaves of the species that are clearly evolved to make the most of the low light levels. Growing the species shaded and wet avoids the brown tips to the leaves we used to suffer when growing Cym. devonianum amongst the other cymbidiums. 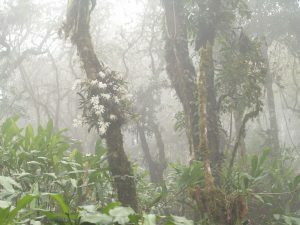 The second large group of plants are Coelogynes including C. cristata, C. nitida, C. fimbriata and C. strica , species we have all seen in the Himalayas. These species are all abundant in suitable habitat above 1500m. C. nitida is particularly abundant around Gangtok and flourishes on mossy trunks and branches amongst its close relatives C. occulata and C. corymbosa. C. cristata has two favoured microhabitats, mossy trunks in wet forest and as a terrestrial on rock faces close to dripping mossy water run offs from the hillsides above. 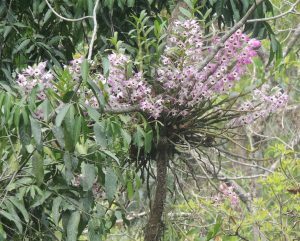 C. stricta can be found amongst C.cristata but we have also seen it growing in more exposed positions especially in Arunachal Pradesh where it grows high in tall trees and so gets exposed to bright light and a little less moisture than the other coelogynes described. A clear indication from these habitat observations is the need for year round moisture for these species. Even though the dry season may have reduced rainfall the coelogynes will all have damp roots on the mossy trees or rocks and so we water our coelogynes throughout the year. The only dry period we give is when flowering as water spray quickly damages these lovely flowers. We grow C.cristata and C.nitida successfully in both of our cooler sections but we have found that C.stricta prefers the slightly warmer Cool Asia section to develop its flowers. We have found d.nobile growing at lower altitudes than the species listed so far with a peak in numbers around 1200m altitude. Despite it appearing to prefer slightly warmer temperatures we find that plants at Writhlington do best with a winter minimum of 100C and heavy watering similar to our coelogynes and cymbidiums. 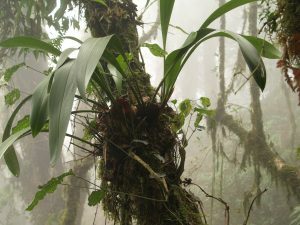 There are of course a host of other species that share these habitats and we grow a number of these including Epigenium species, Bulbophyllum species and Pholidota species. We are massive fans of these rewarding and relatively straight forward species. 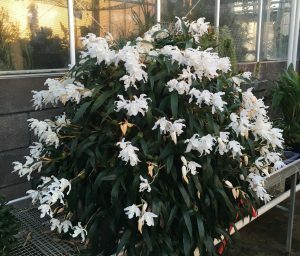 Perhaps in the UK we have forgotten the art of growing cool orchid species and it is time for a revival of the cool greenhouse.